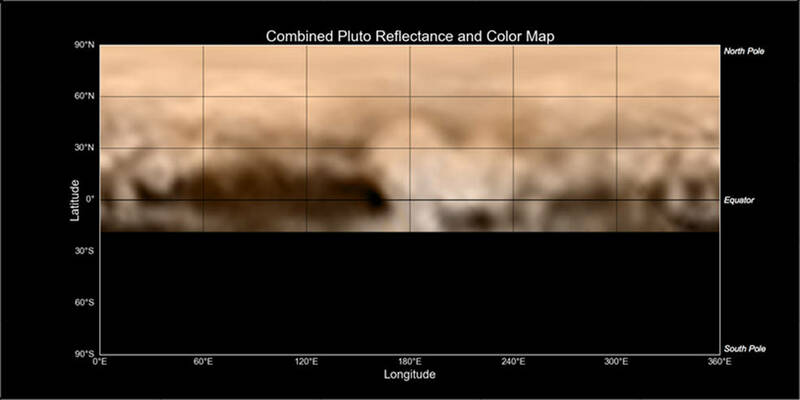 July 7, 2015 – This is the latest map of Pluto created from images taken from June 27 to July 3 by the Long Range Reconnaissance Imager (LORRI) on New Horizons, combined with lower-resolution color data from the spacecraft’s Ralph instrument. The center of the map corresponds to the side of Pluto that will be seen close-up during New Horizons’ July 14 flyby. This map gives mission scientists an important tool to decipher the complex and intriguing pattern of bright and dark markings on Pluto’s surface. Features from all sides of Pluto can now be seen at a glance and from a consistent perspective, making it much easier to compare their shapes and sizes. The elongated dark area informally known as “the whale,” along the equator on the left side of the map, is one of the darkest regions visible to New Horizons. It measures some 1,860 miles (3,000 kilometers) in length. Continuing to the right, along the equator, we see the four mysterious dark spots that have so intrigued the world, each of which is hundreds of miles across. Meanwhile, the whale’s “tail,” at the left end of the dark feature, cradles a bright donut-shaped feature about 200 miles (350 kilometers) across. At first glance it resembles circular features seen elsewhere in the solar system, from impact craters to volcanoes. But scientists are holding off on making any interpretation of this and other features on Pluto until more detailed images are in hand. Of course, higher-resolution images in the days to come will allow mission scientists to make more accurate maps, but this map is a tantalizing preview. 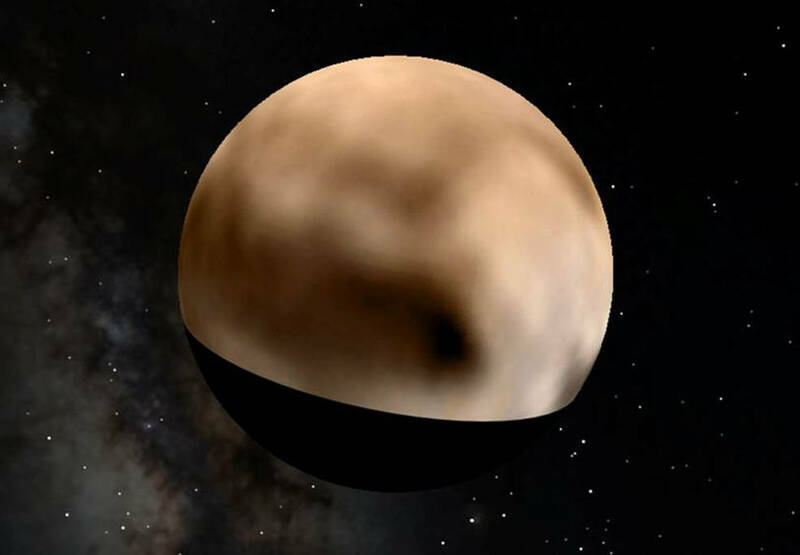 A Google Earth overlay of New Horizons’ latest map of Pluto.